This fruity and highly versatile strawberry sauce is ideal for pancakes and cheesecake. 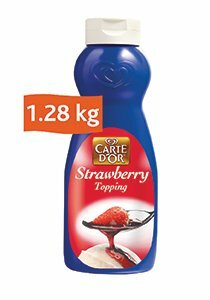 The high fruit content of Carte D'or Strawberry Topping makes it perfect for ice cream and all pastry applications. • Side window for perfect overview. • Try folding Carte D'or Strawberry Topping into some whipped or butter cream as a filling for cakes. • Great solution to be use as a fruit coulis.